With all that succulent drama to indulge in, it can be kind of easy to look past the reason we’re all here in the first, the actual fights. “The best fighting the best” is, optimally speaking, the modus operandi for MMA. With all the failed drug tests, late replacements and interim titles, once can become easily disillusioned, but for the most part we do actually get the best fighting the best and most of the time it’s great. But why is it great? The beautiful technique or the visceral violence? Fine. Sure. Both of those things are excellent, but when we look back, not just on the last twelve months but decades from now, what is it that we will remember? The sweet foot work and distance management of Max Holloway and the utter lunacy exhibited by Thiago Santos will stick in the minds of some, but it’s the stories that will truly stand the test of time. The beauty of a fight is that it is real and anything can happen, and it does, all the time. No fight is the same and we learn something, not just about the people involved, but people in general every time the cage doors close. While the participants are trying to maim each other, a story unfolds before the baying crowd. Sometimes it is ugly, and sometimes it is beautiful, but it is always interesting. Here, in no particular order, are my top fight stories of 2018. An unexpected treat on the mess of a card that was UFC 230. After being devoid of a main event until four weeks before the show Daniel Cormier and Derrick Lewis were thrown money until they said yes, with both being banged up from recent fights. Nate Diaz and Dustin Poirier were also expected to throw down until Poirier sustained an injury, meaning the Nate return would have to wait again. At least we had the fun rematch between Chris Weidman and Luke Rockhold to look forward to. Oh wait, Rockhold got injured again and Weidman was left without an opponent. Thankfully Jacare was fighting lower down on the card, so they bumped him up to the co-main to take on Weidman. It was kind of surprising we’d never seen this fight before given both men’s status as elite middleweights for the last several years. With both falling on hard times as of late, this had a last chance vibe, and that is how they fought. Weidman did great work on the feet, piecing the Brazilian up in the first round. 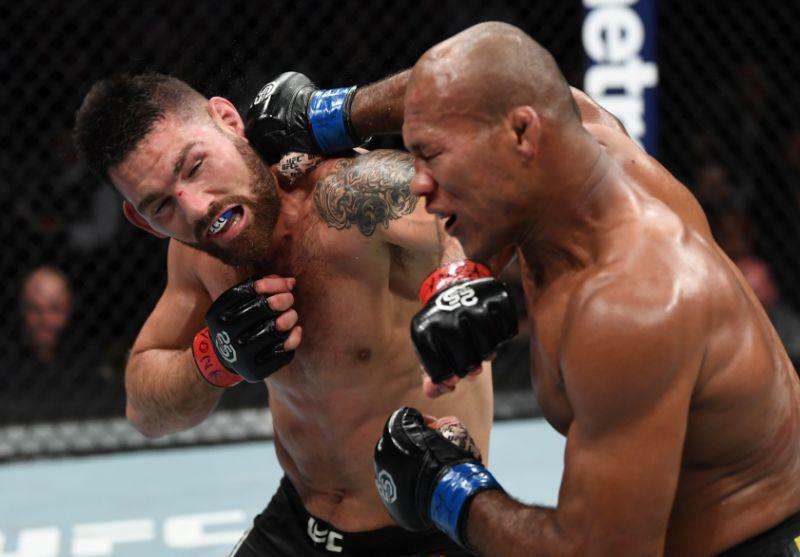 But Jacare bit down on his mouthpiece, refusing to lose and getting even further away from the elusive championship. He boxed his heart out until landing that finishing blow in the third round. It was bittersweet considering how close Weidman was to a title shot and the losing streak he incurred after being defeated for the belt, but this is fighting, it’s a zero sum game. Sometimes a difference in skill level can make a fight boring, but sometimes it can blow the roof of a place. After the hell week of UFC 223 in April of last year, fans just wanted to see some good fights. Zabit and Bochniak gave them exactly what they needed. The highly extolled featherweight prospect Zabit is considered by many to be the next Russian phenom, a complete fighter; “Khabib with striking” as Joe Rogan said during the broadcast. Bochniak is not that. He is a scrappy bruiser from the state of Massachusetts. Zabit was levels above Bochniak in every area, there’s no getting around that, but Bochniak didn’t care. He’d stick his tongue out and eat punches, offer a Ric Flair “woo” as he was taking a beating, and generally exhibited the kind of toughness you can’t teach. Zabit was playful until he realised Bochniak wasn’t here to play games, and as the final round came to a close an exhausted Magomedsharipov stared at a marching Bochniak, unable to finish him. The fight ended with a classic Holloway/Lamas exchange and then a hug, the crowd coming to their feet in honour of the fighters. Zabit took the decision, but Bochniak took our hearts. One of best of stories of 2017 saw a conclusive sequel in 2018. Rose Namajunas shocked the world at UFC 217, starching dominant and feared muay thai striker Joanna Jedrzejczyk in three minutes and taking the strawweight championship home. She did this after weeks of verbal abuse on the part of JJ, where she famously remained ominously stoic. With calls of a “fluke” and plenty of doubt that “Thug” Rose could repeat the performance in a rematch, Joanna was granted a shot at reclaiming her gold. She didn’t, as Namajunas proved there was no fluke as she decisively won a competitive 25 minute kickboxing match with the multiple time world muay thai champion. It felt like a star was born in November of 2017, and this was only reaffirmed in March of 2018. Hear me out. 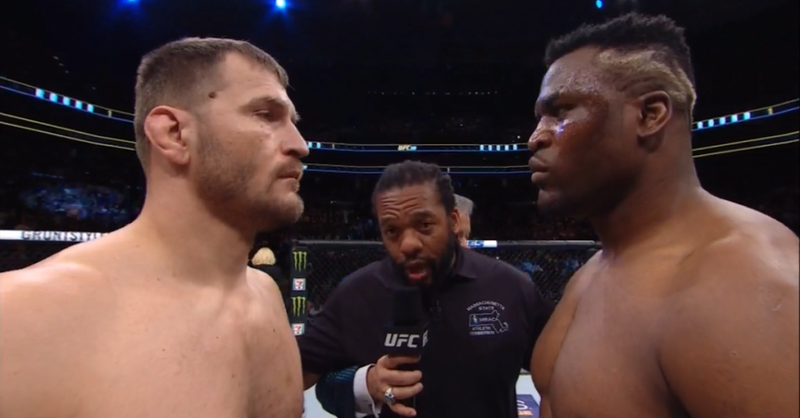 It’s easy to forget this but Miocic vs Ngannou was touted as the most anticipated heavyweight fight in MMA history. Ngannou was the quintessential destroyer, with a terrifying highlight reel full of ice cold knockouts. Miocic was the smaller, but technically sound reigning champion on the cusp of breaking the all time defense record for the heavyweight title. It was all to play for, and there was the feeling that if “The Predator” could wrest the belt from the Ohio native he would be the UFC’s next big star. Ngannou’s power was of the death touch variety, and because of that the first round was a round of the year contender by any metric. The perception was that as soon as Francis connected Stipe would go to sleep. Miocic treated Francis with that exact amount of respect, playing a tantalising game of rope a dope. As Francis hit thin air, he got tired, and then Miocic used his superior wrestling to turn the last four rounds into a fairly uneventful 20 minutes. The dynamic here was interesting, and Miocic, ever complaining at his lack of promotion by the UFC and the focus on his opposition, got to prove he was here to stay. Well, until July at least. Justin Gaethje has had four fights in the UFC since July of 2017 and is already entrenched in the minds of UFC fans. You don’t earn the nickname “The Highlight” if you don’t produce slobberknockers and Gaethje is a damn fight of the year factory. His last fight with James Vick ended with a fast knockout for Gaethje, but the three prior were prolonged chaos with more significant strikes than the Thatcher administration. When he steps into the cage anticipation is through the roof, and in February that was no different. Poirier had a storm to weather. Former featherweight Dustin Poirier proved inconsistent in his run at 145 lbs. Since moving up he has found his footing and entered his fighting prime. Currently riding a four fight win streak he sits at number three in the stacked lightweight division and could well fight for the title this year. Aside from his credentials, he is a born and bred fighter with a back catalogue of violent exhibitions. His fight with Gaethje was burdened with bloody expectations and it delivered and then some. Visceral enjoyment notwithstanding, this was to be a coming of age for whoever was left standing. 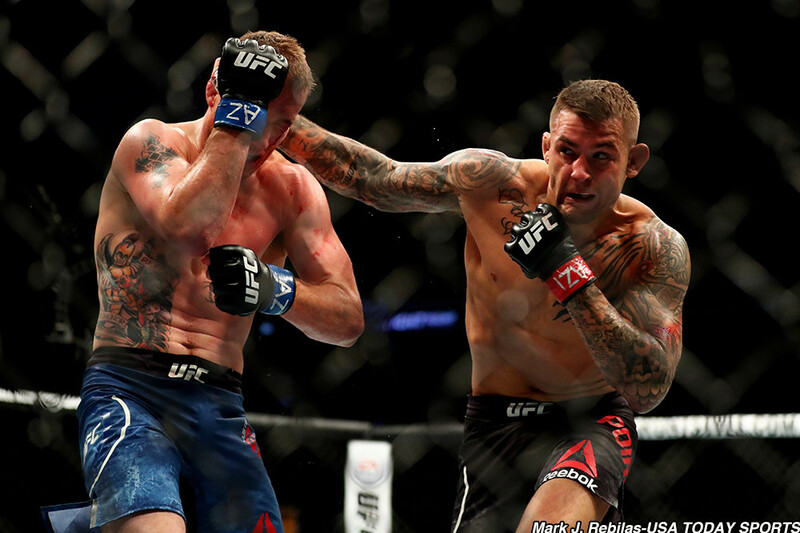 With Gaethje suffering his first career loss a few months prior and Poirier seeking respect at the top tier of fighting, everything was to play for, and that is how it played out. Immense toughness from both men saw the fight go to the fourth, with Poirier being the man to come out the other side. This was two hungry young bruisers battling for their future and it was damn exciting. Images courtesy of fanbuzz.com, nypost.com, mmajunkie.com and sports.yahoo.com.